Birdwatching at Lake Vyrnwy / Llyn Efyrnwy01691 870278work BirdwatchingThe RSPB visitor centre is an ideal place to start your visit. Join a trail through the woodland and birds are soon all around you. You should be able to see and hear pied flycatchers and redstarts, while dippers nest by the lake and rocky streams, great crested grebes and goosanders bob on the water, and above you ravens, buzzards and perhaps a peregrine soar in the skies. Although the hillside makes for difficult terrain, one of the hides in the reserve is accessible by wheelchair. There's plenty for children too, including nestbox trails and bat and owl walks. And if you're new to birdwatching we run regular events throughout the summer. Heather moorland, woodland, meadows, rocky streams and a large reservoir attract a wide variety of wildlife to this reserve set at the southern end of the Berwyn Mountains. Dippers and kingfishers nest by the lake and rocky streams, while ravens and buzzards can be found on the moorland. The RSPB visitor centre is an ideal place to start your visit. Join a trail through the woodland and birds are soon all around you. 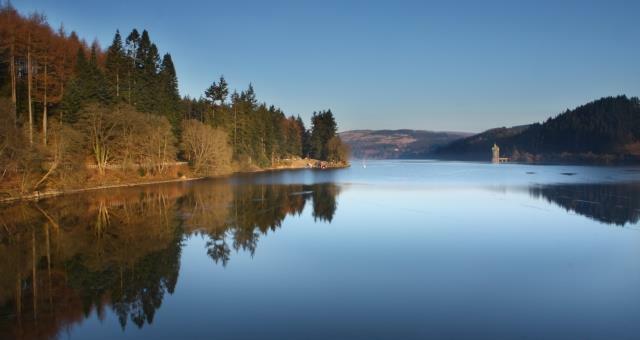 Lake Vyrnwy is popular with both birdwatchers and families alike as it offers a full range of facilities, including a shop, nature trails and birdwatching hides. Visitors can drive around the reservoir by car. Shop opening hours for the winter (1 November - 31 March) are 10.30am - 4.00pm weekdays, and 10.30am - 4.30pm weekends. From 1 April - 31 October the shop is open from 10.30am – 5.30pm. The reserve itself is open at all times.